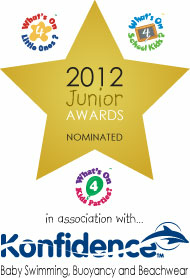 I'm thrilled to say we've been nominated in the What's On 4 Little Ones 2012 Junior Awards in association with Konfidence. We've been nominated in the "Best Children's Party Supplier" category, which means we have at least 5 nominations and are now through to the national voting stage! The winners in each category are voted by the public - by our customers and supporters, so I'm asking YOU to please vote for Funky Dory Party Bags. Voting is easy and only takes a moment - Funky Dory Party Bags are in the "Best Children's Party Supplier" category, which is one up from the bottom. Thank you SO much in advance - it really means the world to us.